A video demonstrating the ability to control Apple’s new iPhone 4S virtual assistant Siri simply by thinking commands took the Internet by storm over the past couple of days, tempting users with the possibility that Siri’s voice functions could be expanded to include form brain input in the future. In just two days, the project – known as Project Black Mirror – appeared in hundreds of news reports, receiving more than 200,000 mentions across the web – but unfortunately for those who were genuinely interested to see the technology become publicly available, it appears to be an elaborate hoax. 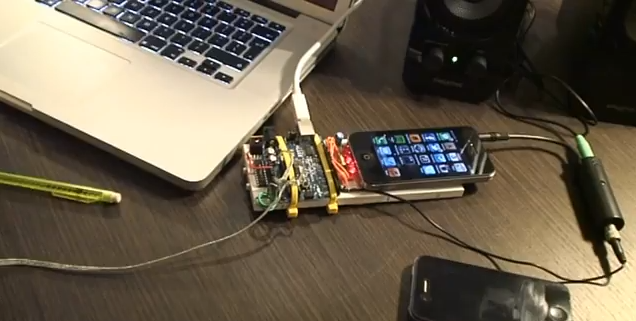 The three guys behind the project showed a video of an iPhone 4S hooked up to an Arduino board, which was then fed into MacBook Pro. Initialising the Siri function on the phone, the video shows one of the team thinking about who they want to call and their complicated setup takes care of the rest. The video is intended to be used as a introduction on a new KickStarter project, a project that invites anyone visiting the site to help fund the technology to make it a mass-market reality – at the time of writing, the video has been watched over 90,000 times. With Matrix-style code running on the MacBook Pro and lots of random LEDs flickering mysteriously like there is some serious code-crunching going on, the video certainly appears genuine – at least to those that are unaware of how the Arduino board and chipsets included on it are used. Greg Courville of Greg’s Lab doesn’t just believe the technology is a little far-fetched, he states that it is a “sloppy fake”. Posting to his website, Courville points out the “big fat red flags” that give away the legitimacy of the project. According to Courville, the SpeakJet chip that the Project Black Mirror team use to analyse speech isn’t connected to very much at all, noting that because it has been placed sideways in the board, it will effectively short “a number of critical pins together and would make it impossible to use”. Next up, Courville says that not only do the team refer to the pads connected to one of their heads as ECG pads (the very same used to monitor heart activity), when it should be EEG. 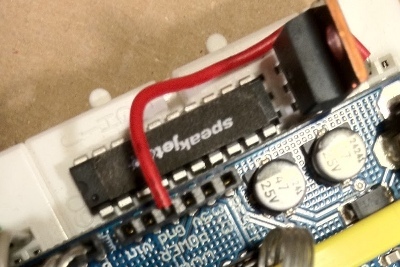 The pads they use produce signals that would not be compatible with the voltage range supported by the Arduino board – another big red flag for the project, it seems. Courville also pours cold water on just how the project team members are recording of brain waves. Noting that the electrodes placed on the scalp would be somewhat unstable and interesting signals would be “buried under loads of interference both from inside and outside the body”, the fact that the team placed electrode leads directly to the analog input terminals on the Arduino suggests that even if the setup was real, it would be very difficult filter the information they wanted from other electrical impulses generated by the body without a dedicated amplifier. With the Project Black Mirror team saying “its a bit sketchy” and having taken a look at the video and referenced Greg Courville’s analysis, it is easy to see why this project has all the hallmarks of being a very elaborate hoax.